This gorgeous, delicious recipe was created by Chef Brian Scheehser of Trellis Restaurant in Kirkland, Washington. Place pears cut side down in a large oven-proof skillet. Drizzle pears with olive oil and sprinkle with sugar. Bake 15 minutes or until just barely tender. Remove pears and cool to room temperature then dice into ¼-inch pieces. Add vinegar to pan, stirring to deglaze any browning on pan. Gently combine pears, peas, and mint with the liquid in pan. Set aside at room temperature until ready to serve. 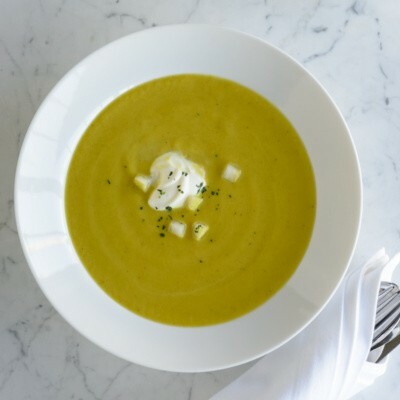 While pears are roasting, prepare soup: Place all soup ingredients in a deep saucepan. Bring to a boil, reduce heat, cover and cook until vegetables are soft. Transfer about half the mixture to a food processor or blender; process until smooth. Repeat with remaining soup. Season to taste with salt and a little pepper. 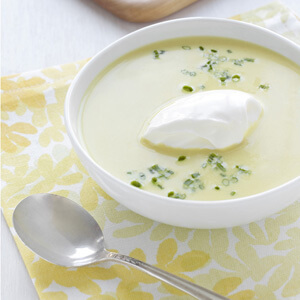 Serve soup in bowls topped with a generous portion of pear relish. Garnish with mint leaves.